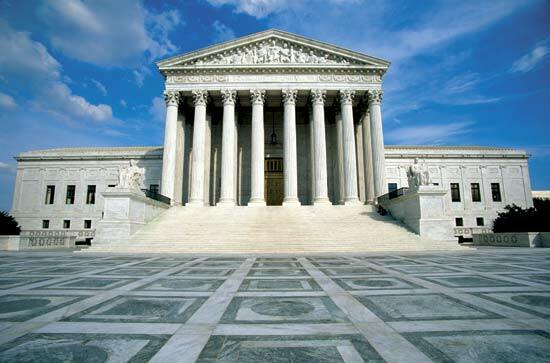 Repeat post from August 9, 2016 originally published as: "The Possible Flaw In The SCOTUS Reason To Vote For Trump"
There is pretty much of a consensus among pundits that because of the age of many of the Supreme Court justices, that in the near future there could be three or four new appointments coming to the Supreme Court [besides the one that is already on the table]. Now no one knows how many years that will be when all these appointments will be necessary. The time period becomes crucial to those who argue that Republicans must vote for Trump because generations of Supreme Court decisions are on the line. Why is it critical? Here is my theory as to why. I believe that because of both Clinton and Trump's high un-favorable ratings with the electorate, that whoever wins this election will become the least popular president going into their term as president in the history of this country; and that because in 2020 they will be facing a much stronger and less unfavorable opponent than they did this year, they will more likely than not be a one term president. That will also mean the party that does not win the White House this time will be the party in power in 2020 with a good chance of being president from 2020-2028. So, if my theory is correct, unless there are more vacancies to the court in the next three years, it will be the president starting in the year 2020 who will determine the direction of the court for generations to come. Wait, I know what you're saying. Why did I say the next three years instead of the four years of this next president's term? That's because let's say Donald Trump is the president and a vacancy occurs in the fourth year of his term. Does anyone in their right mind think that the Democrats will allow that nominee to go through, even if they don't regain the Senate? It will be the same situation if Hillary Clinton is elected president. The GOP is blocking Barack Obama's pick now and they will surely do it again if this is the fourth year of a Clinton presidency, especially with prospects looking good for a GOP win in 2020. Now, I'd like someone like Nate Silver to figure out the odds of when these 3 or 4 nominees are more likely to occur. Within the next 3 years starting in January [2017-2019] or from [2019-2027]. I'll bet, and this is just a guess, it will be the later years and not the next three years when all those vacancies occur. If that is true than that means it could be the party who loses the presidential election this time around that will be the one who determines the direction of the court for generations to come. In other words, I could just as easily argue that to vote for Trump and a Trump presidency [that probably would only be for one term] will guarantee that the liberal Democrats will determine the direction of the court for generations to come. So, those of you arguing we must vote for Trump because of the future of the Supreme Court could be right, but I think you have to admit it is possible my theory is correct which would mean a Trump presidency would actually do just the opposite of what you are hoping for in the shaping of the Supreme Court. This post is not to argue that my theory is a certainty to occur but just to show the flaw in those who use the "future of the SCOTUS" argument as the reason we must vote for Donald J. Trump. We will find out by 2020, but I really believe whichever party loses the presidential election this year will be the one that shapes the United States Supreme Court for generations. Mike, if Trump loses (which he is likely to do), the Senate will also turn Democrat. The demos will change the rules, requiring only a majority vote to approve a SCOTUS nominee. I still think we're screwed. But it will be up to us to save the Senate even if Trump loses. that's why I urge all to vote even if you are skipping the presidential line. It can be never trumpers that ironically save the Senate big Harry.